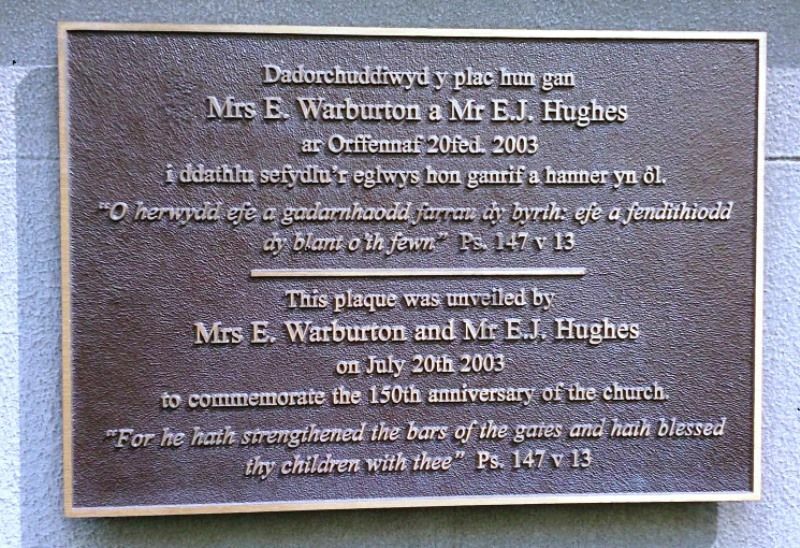 A plaque commemorates the 150th anniversary of the foundation of the Welsh Church in Melbourne. A number of Welsh Calvinist Methodist communities were established on the goldfields where Welsh churches were also established, notably in Ballarat, Sebastopol and Maldon. Welsh miners had gathered for worship at the Collins Street Baptist Church in December 1852 and from 1853 at the Common School in Collins Street, but in 1854 a site in La Trobe Street was granted by the government for the designated purpose of a Welsh Calvinist Methodist Church. A small chapel was built on this site in 1856, with the words 'Welsh Chapel' written in gilt letters above the door. The Welsh language was an important element of church services, as was music and singing. Services were delivered in both Welsh and English. to commemorate the 150th anniversary of the church.